What. The. Favourite. For those of us watching all of this year’s Best Picture nominees, The Favourite (2018) is certainly the token “artsy” film of the set. It felt like it was following in the footsteps of last year’s Phantom Thread (2017) in that the set decoration and costume design were exquisite, despite the—let’s face it—weird characters. Regarding the plot, though, I did find The Favourite to parallel the events in the 1950 Best Picture winner, All About Eve. While its art is on full display for all to see, The Favourite is a bit more than how it looks. Aside from the aforementioned set decoration and costume design, I have to applaud this movie’s cinematography. I’d wager that it’ll win in these three categories, but the cinematography stands out because it’s so different from most films. Heavily utilizing wide-angle fisheye lenses, as well as copious amounts of natural light (perhaps as an aesthetic homage to Kubrick’s Barry Lyndon (1975), which also shares a somewhat similar plot), the continual movement of the camera is both brilliant and jarring. This accentuates the awkward and uncomfortable situations these characters put themselves in for the duration. While The Favourite is pretty to look at, the characters and their interactions reveal the true “artsy” elements of the film. From tons of lesbian overtones to odd actions and dialogue that is distinctly modern in its vulgarity, some moments definitely made me cringe. All that being said, the nuance and subtlety of the actors’ fantastic performances allowed so much to be said without uttering a word. The Favourite excels in the “show, don’t tell” mentality by also including many parallels and realizations that nothing has changed for these characters. Fortunately, moments of levity, especially with Nicholas Hoult’s character, help to keep this movie from getting too dark. 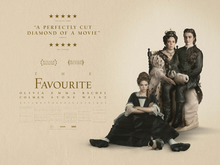 A striking and considerably “artsy” film, I give The Favourite 4.0 stars out of 5.